FCB@5 (Friday Consortium Blogging at Five p.m.) is once again the order of the day. All amazing topics to work on, and approached from very different directions by each one of us, providing interesting reading from the whole group. Hopefully Marianna is healing well and able to join in the fun very soon If you are playing catch-up I recommend you grab a coffee, find a comfortable chair and have a read. This poor quality oldie dates from 11th August 1964. How do I know? The date was written on the back. The two ladies had the same first name and both surnames began with the same letter. Both lived in Ireland, one was born in Dublin and the other in Cork. They lived next door to each other for over 50 years. Between them they reared eleven children. They called on each other in times of trouble, yet there was no running in and out of each others house. Right throughout those years despite knowing each others first names they always referred to each other as Mrs (insert name). They talked regularly, always through the gap in the hedge. Hanging clothes on the line drew the little woman on the right out into the garden for a bit of a chat. Now, many years later, I realise that perhaps she was lonely during the day when her husband was at work and the children at school or at work as they grew older. Her husband was also from Cork and they had no other relations in Dublin. They had no telephone or car. Her house was always spotless with the quietness of a library even when all the family were at home. The only time you heard any sound was on a summers day like in the photo, when all the windows would be open and she sang as sweet as a bird while she worked around her house. A very soft spoken woman, but if you listened intently she told you all the news from the neighbourhood. When her voice became a whisper, the gossip was juicy! The lady on the left was my mother. 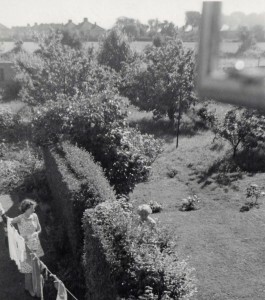 Back in those days about four clothes lines criss-crossed our garden on washing day and they were all well filled with sheets, shirts, tablecloths and all the other garments that were required by a large household. The lines were removed when the dry clothing was un-pegged and taken indoors for ironing. I remember a time way back…. when I had to really stretch up to reach the line to either peg on or remove the clothes. On one such day as I was struggling to remove a sheet larger than myself, I heard the familiar voice from through the hedge call my name. “Marie, is mammy sick?” our neighbour asked. “Yes” I replied. “Mammy has migraine again, she has been in bed for two days”. “I thought so” said the lady. “The clothes were hung differently to the way your mammy hangs them” she added. She quickly followed with “Are you managing? Is there anything I can do to help”? Mammy never minded standing chatting in good weather but on a winters day she liked to keep the talking as short as possible. They never thought to call and visit each other and talk over a pot of tea, it was always through the hedge. As we grew older, when mammy was going out to the line on a cold day she would say “Don’t leave me out there too long, call me for the phone or the oven”! If you hover over this photo you will see the title ‘Mammy the phone is ringing’. We are no different today. We still chat or talk ‘on-line’ all the time; but our ‘on-line’ is the internet enabling us to chat by using our voice, fingers or webcam, through email, IM, Twitter, Skype, Facebook or Blogging; not alone through the hedge but to folks on the other side of the globe, at any hour of the day or night no matter whether the weather is hot or cold, wet or dry, just as easily as if they were in the garden next door. Thathaasthu – so be it. Keep talking and have fun! PS. I wonder if these two ladies have found a gap in a hedge in the afterlife? This entry was posted in Loose Consortium Blogging on July 31, 2009 by Grannymar. 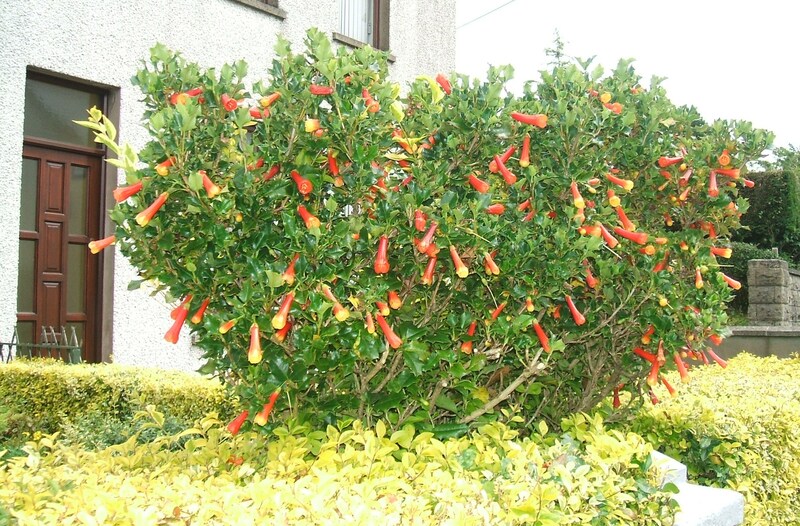 I passed this shrub yesterday and once again I wondered what it was called. 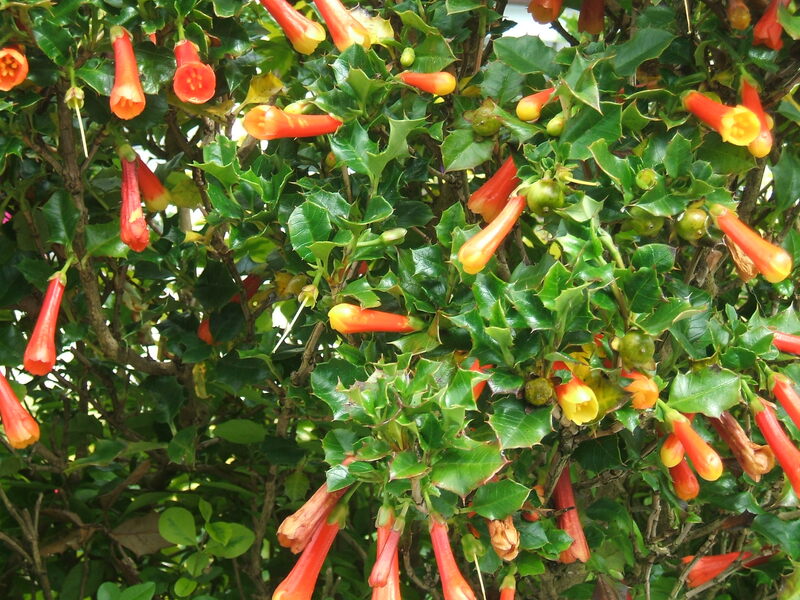 The leaves are shaped like holly, yet in high summer it produces a mass of colour with trumpet shaped flowers. It is the only bush like it that I have ever seen and the householder was unable to give me a name for it. Magpie! Are you familiar with it? UPDATE: Through the wonderful world of blogging friends we didn’t have to wait long! Desfontainea spinosa is your answer. Thank you Nelly and please pass on a great big hug to Bert the sleepy clarinet playing horticulturist for his wisdom! Now give that man another slice of cake! Now don’t forget to come back at 5p.m. for a spot of loose blogging…. It was my turn to pick the topic this week! This entry was posted in Photography on July 31, 2009 by Grannymar.